This TopZero sink is made with high-quality, 304 stainless steel. The soft satin finish makes this beautiful sink ideal for any kitchen. You’ll never have to worry about grime or scum building up around the rim of this sink, because there’s no rim! When you want to create the ultimate, modern kitchen in your Barbados home, then the TopZero Monaco Sink is a must. 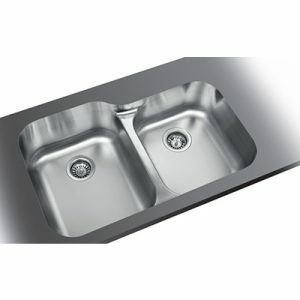 This is a stainless steel double sink that makes it easy to do everything from cooking to cleaning up. And since this is a TopZero kitchen sink, you’ll get the modern, rimless design that TopZero is famous for. This kitchen sink is also coated with aluminum for added strength and durability, as well as exterior sound absorbing pads, keeping your kitchen quiet and comfortable.